Forest Lawn today unveiled an historic marker honoring early Buffalo settler, Erastus Granger, at a special ceremony. The marker was made possible by a generous donation from The William G. Pomeroy Foundation of Syracuse, NY. The three-feet-wide by two-feet-high 50 lb. cast aluminum marker was placed in Section 20 of Forest Lawn, near the site where Granger’s homestead, known as Granger Farm, once stood. 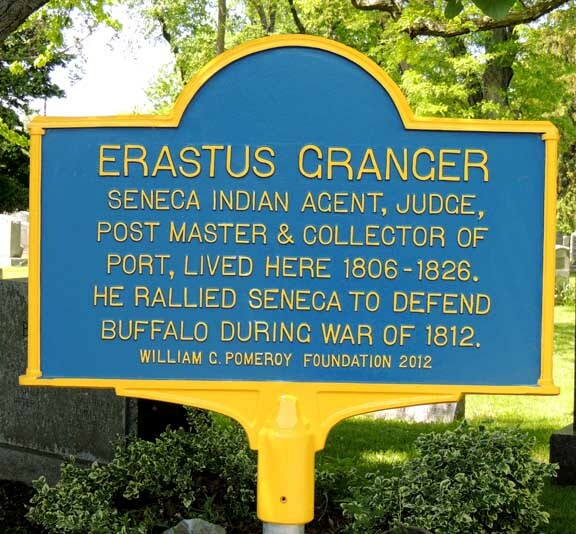 Erastus Granger was appointed Agent to the Seneca Indians by President Thomas Jefferson and sent to Buffalo Creek in 1804. He purchased the stately two-story wood home, with several outbuildings and surrounded by tall poplar trees, as well as several hundred acres of land; at the time of his death, Erastus Granger owned nearly 700 acres, stretching from Main Street to the Niagara River. Mr. Granger became Postmaster of Buffalo Creek, a judge and, soon, a pillar of the growing community. He was a trusted and respected friend of the Senecas, becoming particularly close to Red Jacket, the renowned Seneca Chief of the Wolf Clan. He allowed the Senecas to conduct their traditional “councils among the mighty oaks” at his home. When war broke out in 1812, Granger’s role was to keep the Senecas neutral. His home became the headquarters of General Alexander Smyth and his staff, who arrived in 1812 with plans to invade Canada. As the war escalated, the Senecas were eager to engage, and Granger, realizing the need for their assistance, summoned the Seneca Chiefs to his home in July 1813 to prepare for battle. The next day, he led them into battle at Black Rock, repulsing the British attack and signaling the Senecas’ entry into the war alongside the Americans. When the British burned much of Buffalo, Granger’s home – well outside city limits – was left untouched, and provided shelter for many who lost their homes during the attack. The home also served as the Post Office until Buffalo could rebuild. Erastus Granger again led the Senecas into battle with General Jacob Brown’s Left Division, playing a huge part in the Battle of Chippawa in Canada in July 1814. 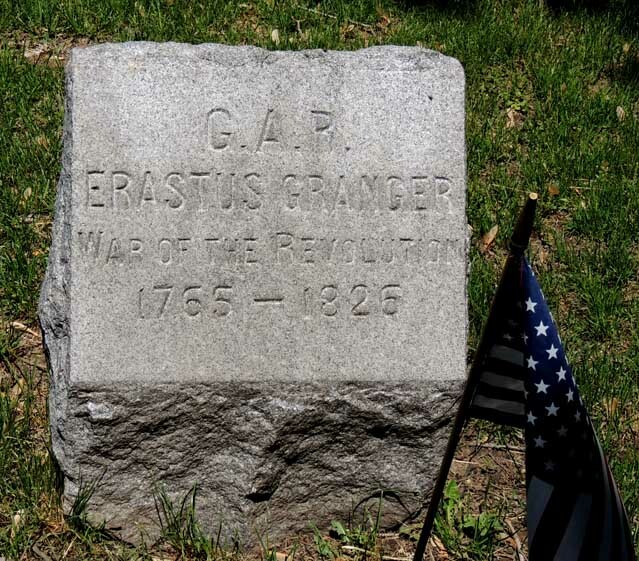 Erastus Granger died in 1826 and was buried in the family burial lot, known to family members as “the turnip patch.” In 1849, Buffalo attorney Charles Clarke purchased 80 acres of land from Granger’s widow and two sons and designated it for use as a cemetery. Today, Forest Lawn consists of 269 acres; the Granger family lot – the “turnip patch” – remains in what is now Section J.